The new Hart Prarie quad at Arizona Snowbowl will be among the first Doppelmayr Alpen Stars in a top drive configuration. After debuting the Humphreys Peak Quad in 2015 and the Grand Canyon Express in 2016, Arizona Snowbowl will replace its Hart Prarie lift this summer, marking another major investment by owner James Coleman. 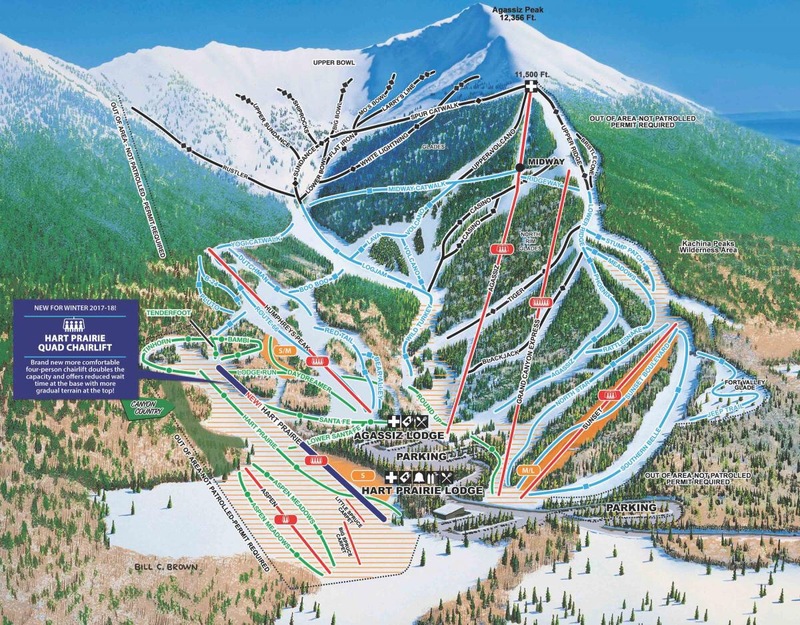 Surprisingly, the contract went to Doppelmayr and Snowbowl will operate new lifts from all three major manufacturers next winter. In a blog post announcing the project, General Manager J.R. Murray noted, “Arizona Snowbowl enjoys having the best learn to ski and snowboard progression terrain in the entire western US with Hart Prairie boasting a wide open and gentle meadow, allowing beginners to learn and gain confidence on the slopes. Snowbowl is where Arizonans learn to ski and snowboard because of the fantastic and easy terrain.” The new quad chair will only improve that offering. Hart Prarie is a 1981 Riblet with center-pole double chairs, one of two such lifts remaining at the resort. The new top drive, Alpen Star-model Hart Prarie will feature a Chairkit loading carpet, padded seats and footrests. An 1,800 skier per hour capacity doubles that of the previous lift. The alignment will be slightly shorter – 2,533 feet – with a vertical of 518′. 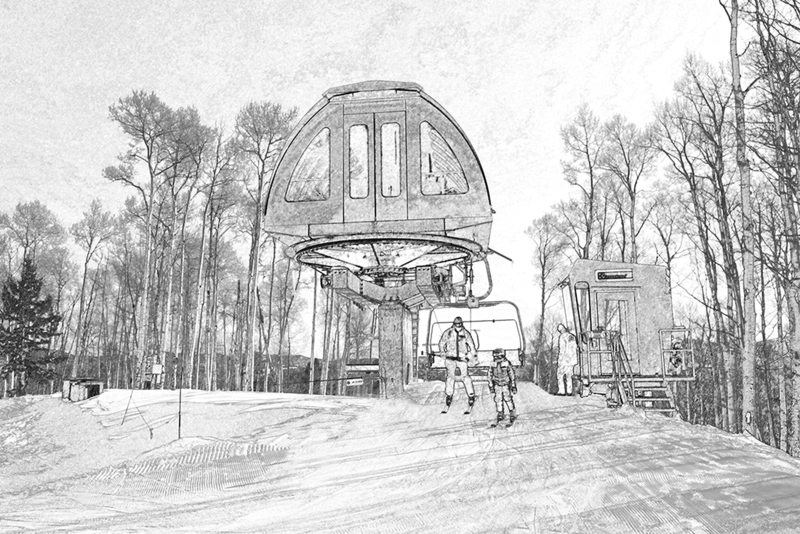 With new Skytrac, Leitner-Poma and Doppelmayr chairlifts built since 2015, Snowbowl will have increased uphill capacity by 85 percent next winter. Impressive indeed. Does anyone know which company Belleayre went with? They have not responded to my email inquiry. If the Catskill Flyer goes to Doppelmayr, that would bring them to 14 lifts for 2017. I have Leitner-Poma at 12 plus 5 Skytracs with one each for Partek and SkyTrans. An interesting year to say the least. Peter, do you know how easily these quads could be upgraded to express lifts? Not easily. Skytrac doesn’t make detachable lifts so there’s no precedent there. The Doppelmayr will probably have too narrow of gauge to be converted to a detach. These lifts are short enough that I really don’t see the need. Tom, Peter can correct me if I am wrong, but in most cases when it comes to a fixed grip lift that gets upgraded to HSQ, about the only thing that can be reused are the towers themselves, and MAYBE the carriers, if they can be equipped with new grips for detatchables. Both terminals have to be replaced, shivs likely have to be replaced, I do believe there is a difference between shivs for fixed grip vs those for high speed. They may look the same but the bearings may be different as well as the shiv liners.